Growth was 0.6% with regard to the previous month, January 2005. Industrial production grew 0.1% in the A.C. of the Basque Country in February 2005 with regard to the same month in 2004, in homogeneous terms of the working calendar, according to EUSTAT data. Industrial production in the A.C. of the Basque Country grew 0.6% in February 2005 compared to January the same year, once the index was adjusted for seasonal effects. Over the past month of January this month on month rate had registered a 1.1% increase and, therefore, the inter-monthly evolution for the second month of the year marks a slight slowdown in relation to the same month of the year. By sectors, based on the classification of large industrial sectors, the evolution of the index in February 2005 with regard to February 2004 presented growth for Energy (3.4%) and Capital Goods (0.9%). Consumer Goods fell by 4.2%. They are divided between Durable consumer goods, which underwent 4.4% inter-annual growth, and Non-durable consumer goods, which registered an 8.1% decrease. In addition, Intermediate goods presented negative -0,4% inter-annual rates. Inter-monthly variations in February 2005, in relation to January 2005, were positive for the large industrial sectors of Capital goods (0.9%), Intermediate goods (0.8%) and Energy (0.5%). Consumer goods show a 2.2% inter-monthly fall; among the latter, however, Durable consumer goods grew 2.1% in relation to the previous month and Non-durable consumer goods fell 4.4%. By province, the inter-annual variation in the Industrial Production Index were quite different, falling 6.4% in Alava and increasing 0.2% in Bizkaia and 4.0% in Gipuzkoa. Inter-monthly growth rates by province, February 2005 with regard to January the same year, have performed differently, rising 3.1% in Gipuzkoa and falling 0.6% in Alava and 1.0% in Bizkaia. Note: Following the recommendations made by Eurostat in the document “Methodology of Short-term Business Statistics. Interpretation and Guidelines. 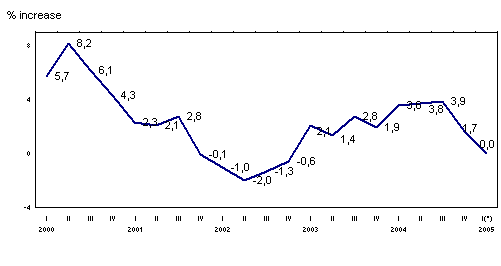 2002 edition”, Eustat has been using in its analyses, as of January 2005, the series corrected for calendar effects in inter-annual rates (m/m-12) and accumulated growth (At/At-1), and the deseasonalised series for the inter-monthly rates (m/m-1). The gross data and the data bank continue to be available to Eustat web users.